"The chamber was dark. The seven of them were rarely in a room together anymore, but this was the eve of their greatest journey, a plan that overcame death and spanned universes." The Techeuns, also known as Tech Witches, are employed by Queen Mara Sov as her personal advisors. They are, essentially, an order of mystics charged with studying paracausal forces. Three of Queen Mara Sov's Techeuns were Taken following the Battle of Saturn, while the remaining four perished shortly before the others were freed. The Techeuns of the Reef have their origins in the eutechs of the Distributary. After the establishment of Awoken society in the Distributary, the eutechs were charged with preserving the technology that had been brought with them into the pocket universe. Under the rule of Queen Devna Tel, two eutechs, Imar and Yara, rose to prominence as her advisors. Imar was notable for being one of the few male eutechs. After her faction departed the Distributary, Mara decreed that as the paracausal forces apparent in the Solar System (including those newly inherent to the Awoken) could not be explained through science alone, they required an order of witches to explore and tend to them. Those eutechs who accompanied her out of the Distributary were thus invested as the first Techeuns, and granted unilateral authority in their studies. The Techeuns possess strange powers of mysterious origins; they wear blue, jewel-like implants of some kind, which may enhance or refine these powers. Two of their known abilities are illusions and telepathy. The Techeuns have always served the Queen in some capacity, but recently have replaced her Fallen bodyguards after the Wolves' rebellion. Variks is quite wary of the Techeuns' power, to the point that he'd dock his arms before going near them. Unlike the Guardians, their power appears to be unconnected to the Traveler. The Techeuns made their first physical appearance in The Taken King when they followed their Queen into battle against Oryx, the Taken King at the Battle of Saturn. Acting in synergy with the Queen they conjured a collection of powerful projectiles, the Harbingers, which tore apart every Hive cruiser in their way and pulled thousands of Tombships in their wake. They were unable to even scratch Oryx's Dreadnaught, however, and were instead apparently absorbed by the hull. The three Techeuns who were present in the battle are presumed dead by the Reef, along with the Queen. This was apparently planned for by the Coven, as they sought to somehow usurp Oryx's power from him with the Harbingers. It remains to be seen if they prevailed. The surviving Techeuns did not cooperate well with the Reef's interim regent, Petra Venj. However, they acquiesced to partnership in Reef experiments to extract and control Taken energies. Their participation in the transfer process increased success rates to 100%, with only one Techeun needing to be present at a time. Following the Battle of Saturn, Sedia, Shuro Chi, and Kalli - formerly presumed deceased - were all Taken by Oryx, the Taken King. Following his death, Savathûn assumed control of them, where they now serve under her champion, the Taken Ahamkara Riven, within the Dreaming City. Fortunately, a Guardian Raid team managed to breach the Dreaming City and actually free the Techeuns from their Taken corruption which allowed them to aid the Guardians in defeating Riven and cleanse the Awoken homeland. 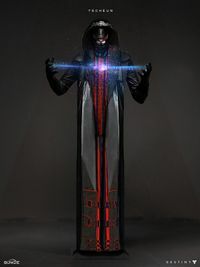 The Techeuns could be in fact the first and only known beings to break free from the Taken corruption with the aid of Guardians. Given that the Techeuns were crucial in fulfilling Riven's last wish that allowed the Dreaming City to be taken, thus beginning Savathun's plan, it was likely the Witch-Queen intentionally made this possible. Techeuns Shuro, Sedia, and Kalli acting in concert with Mara Sov at the Battle of Saturn. A closeup reference sheet of a Techeun. The full reference sheet of a Techeun. Reference sheet for Techeuns as they appear in Destiny 2. Closeup of the Destiny 2 model.